Here are some frugal and fun things for babies and young children to do with food. Go ahead, play with your food! Make ice cubes with food coloring in a variety of colors. Let your child ‘paint’ with them on a piece of paper or an old, light colored dishtowel. Just don’t let your husband serve iced drinks to the neighbors! You need toothpicks, small pieces of fruit in a variety of colors and shapes such as yellow pineapple triangles, orange half slices, red plum squares as well as some smaller dried fruits like raisins or dried mango. Stick the smaller pieces onto the big piece of fruit, like a Mr Potato head, but if you want your creation to be edible, don’t use a potato! 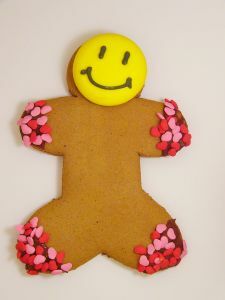 Kids can decorate graham crackers or gingerbread cookies with a variety of frostings and candy. The most fun, is, of course, in the eating of the materials! Babies love to squish their food between their fingers, so why not indulge them? Cook and then mash some potatoes, but don’t add any butter, milk etc. You can make it thicker using rice cereal, and color it with food coloring. As a side note, for babies that no longer like to eat food with a spoon, thickening it with rice cereal and rolling it into little balls allows them the independence they crave and the nutrition they need. Use a Pringles’ can (I know that you’re going to have to go out and buy one, but it’s just for this project. I understand) or a coffee container. Place a handful of dried beans or rice in it. Then seal the lid using glue or a really strong tape like duct tape. 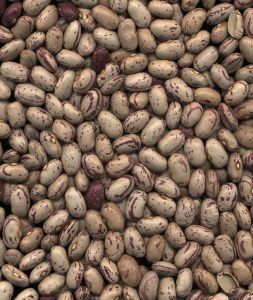 You can experiment with different sized containers and beans: film canisters will make a different noise than a coffee can for example. What are your kids’ favorite toys using food? Okay… I LOVE these ideas! Thanks so much!!! Great ideas, and great theme. (I use Thesis too). Hah! that is awesome…now I gotta work on having kids…. .-= J. Money´s last blog ..3 Lessons Starbucks Reminded Me of Today. =-. Great stuff! I love the pringles rain sticks idea. I have a 2 1/2 year old daughter who would love these!! .-= Jason @ Redeeming Riches´s last blog ..7 Tips to Achieve Retirement Success =-. Previous post: How Do You Describe Yourself?